(Dundee, NY) Davie Franek made the four-hour tow from Wantage, New Jersey to Outlaw Speedway on Saturday night for the Outlaw Fall Nationals and it was well worth it leading the final 23 laps and scoring the Third Annual Outlaw Fall Nationals. The race was shortened to 27 laps in respect to Greg Hodnett, who lost his life this past week at sprint car event in Pennsylvania. It was Parker Evans and Steven Hutchinson Jr who started on the front by virtue of a dash put on by the Outlaw Speedway management that took place at the beginning of the night. Franek started in the third spot and wasted no time challenging for the lead. Parker Evans would jump out for the lead in the first three circuits before Franek took over the on lap four. Franek was just about to encounter lap traffic on lap eight which allowed Lucas Wolfe and Chuck Hebing to start to gain ground on the race leader. The first caution would come out on lap ten as Denny Peebles would come to a stop on the front stretch just before turn one. At the same time, Mark Smith was parked at the top of turn two. Franek would start to get challenged for the lead by Wolfe, Hebing and Steven Hutchinson Jr on the next restart, but Franek was still able to pull away as Wolfe and Hebing continued to exchange position. Jared Zimbardi would continue to move forward as well and was just outside of a podium position. A couple of laps later, Zimbardi would come to a stop on turn four bringing the second yellow of the A Main which would restack the field once again. On lap 20, Franek would lead Wolfe, Hebing, Trenca and Steven Hutchinson Jr. Two drivers who came from back in the field were Jason Shultz who started 14th and B-Main Winner, Derek Locke who started 24th. Both drivers found themselves in the top ten by the lap 20 restart. Franek would once again fire off a flawless restart and start to pull away from Wolfe and Hebing with just seven laps to go. After Franek was able to place a few lap cars in between himself and the rest of the field, he would extend his lead and go on to score the $5,000 pay day. Franek and his team knew what they had to do pick up the win over a very stout field. After what was an emotional week for so many sprint car drivers across the country, Franek certainly dedicated this win to Greg Hodnett. 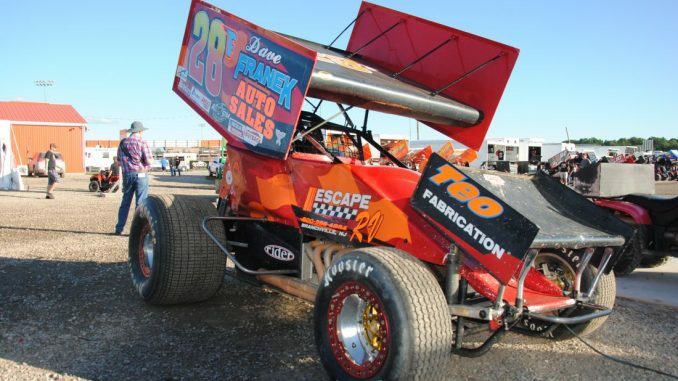 Chuck Hebing was able to just get by Lucas Wolfe for the second spot and take home yet another podium finish with the Patriots in 2018. Lucas Wolfe made the trip up from Pennsylvania and was quite satisfied with limited starts on New York race tracks. This was Franek’s first ever win at Outlaw and his fifth career win with the Patriot Sprint Tour. Heat wins went to Mark Smith, Jared Zimbardi, Lucas Wolfe and Chuck Hebing. Franek would win the rows 2-5 dash while Derek Locke would take home the B-Main event. That will do it for the 2018 Patriot Sprint Tour season. Chuck Hebing would go on to win the 2018 Championship over Jordan Thomas, Kyle Drum, Scott Goodrich, Pete Richardson and Steve Glover. PST President Mike Emhof would like to thank all the drivers, crews and supporting sponsors for another fantastic season. The end of the year banquet will be held on Friday, November 16 at the Vernon Downs Casino in Vernon, NY. It will once again be a combined program with the CRSA Tour. For upcoming news and other special announcements, please be sure to log onto www.patriotsprinttour.com as well as following @PatriotSprints on Instagram and Twitter.